We remove barriers between the home you have and the home you could have with the time and all the skills to do it yourself. Our services tailor what you already own to how you use your space. We work with you to create a layout that makes your life more enjoyable, more comfortable, and easier. We get to know a bit about how you live your life as a whole before visiting your apartment. Understanding what you do when you aren't at home we can focus on how you use your apartment, making it easier to edit for functionality. By elevating what is important to you, coming home feels better. Using space planning, home organizing, and minor repairs to transform the functionality of your apartment for a fraction of the cost, work, disruption, and time of a renovation. I can't stand living like this for one more minute. What can you do for me right now? We've all been there. By contacting us, help is on the way. We can refer apartment cleaning services and establish an action plan to managing whatever you're going through. It took awhile to get this way. We've developed a long term solution to apartment woes that takes 2 weeks of planning before beginning the physical work. In retrospect, you'll be shocked how fast enormous change took place. Inexpensive long term results require planning. How is this different from interior design services? We offer apartment functionality services for people who are looking to make the most of what they have. New York at Home works with people who are looking to get more from their space with minimal disruption. When you rent, you are unlikely to invest the same way an owner might. We make efficient use of your time by quickly turning your feedback into an action plan. Changes in placement , decor, and editing of belongs are easy for us to plan and we make it easy to implement. Extensive planning is needed before moving walls, upgrading cabinets, adding electrical, and replacing furniture. A few months of disruption is typical of a home renovation project that requires interior design services. It's expensive because it takes a time for skilled artisans to plan and complete the work. With New York at Home, the transformation of most one bedroom apartments takes under 15 hours plus materials. This includes at least 5 hours of planning. I'm looking for home organizing. Is this home organizing? Yes! An organized home is a welcome side effect of our method. We work with you to identify your priorities and goals, which includes articulating your natural organizing style. We collaborate to organize your home in a functional way for the long term. Our focus is on you, not your stuff. In order to strategically solve your apartment challenges, we emphasis planning first. Time spent up front creating your own guidelines simplifies the editing process, saving you hours of painful deliberation. We believe planning is essential to dramatic results that are easy to maintain long term. If you are simply looking for a helpful pair of eyes when editing your belongings, we're happy to provide that service as well. Just mention this when reaching out. Do you organize closets? What about getting rid of clutter? Yes. We offer these services because finding what you need when you need it is a big part of a functional home. That said, if items are just cluttering up our apartment, we would have donated them already, right? We help you look at belongings through the filter of function to identify tools as opposed to clutter. That old saying about trash and treasures couldn't hold more true! Without the right storage solutions in place, living spaces can feel unwelcoming. With the right storage solutions, belongings can be both out of sight and at our fingertips. Finding small ways to create a sense of luxury for items used daily makes it easier to part with "just in case" belongings . How long does an apartment solution take? The transformation of an average one bedroom apartment could take 15 hours plus materials. This includes at least 5 hours of planning. Our work will not prevent you from using your apartment while making adjustments. We begin with a strategy session. Reconciling how you live with how your apartment is set up involves several hours of deep work after our initial meeting. Creating of an action plan takes a minimum of 3 hours (independent of you) during the week following the consultation. Two weeks between the consultation and the first session is ideal but since goals vary so does timeline. This schedule gives us time to work together on a clear plan so we make the most of our appointments and also find a cadence that works best for you. Each work session usually takes 3 - 4 hours. Like working with a good coach, we give you framework and guidance to do so much more than you would on your own. Working together, you have ownership of the system you took an active role in creating. Maintenance is simple. We also provide more traditional organizing services independent of you. Link here for additional information about our concierge services if you are looking to give yourself the gift of time. I have a house. Is this just for apartments? We love working with houses! 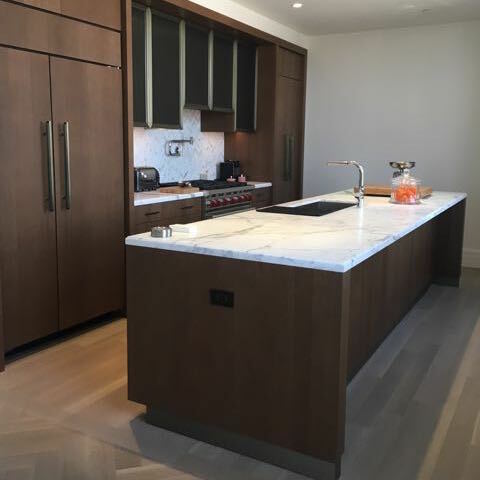 We've helped make the most of basements, garages, patios, foyers, attics and gardens as well as living rooms, bedrooms, kitchens, bathrooms, closets, and dining rooms. Our approach is focused on you and your needs, be it a studio or full home. Making a home more functional sometimes takes the same amount of time as an apartment since more creativity is required to make smaller spaces accommodate all your needs. Where do you work? What is your pricing structure? We have clients all over the New York area, from the East Village to Hoboken to Larchmont to Times Square to Williamsburg. A flat hourly rate of $150 makes it easy to focus on keeping you happy while doing the best possible work. We are happy to schedule trusted artisans and contractors on your behalf as part of our concierge services. Our rates do not include travel time. Smaller jobs that take under an hour are priced with this in mind. If you are plane ride away from New York City and love what we have to offer, drop us a note. We're open to opportunities. How much does a complete apartment solution cost? All apartment solution services begin with a strategy session. For $500 we lead a strategic conversation to create an opportunity for you to brainstorm a clear scope of work and project goals. From there, our hourly rate of $150 applies to time spent on your project. We work with you to set expectation around a budget as part of the strategy session. How much time we spend together as well as time apart working on floor plans and furniture sourcing, furniture shifts, donation pick-ups, and minor purchases are dependent your work style. Investments such as refinishing the floors or purchasing new furniture are also subject to taste. People looking to delegate more will spend more. The hourly rate applies to all work related to your project, be it a floor plan or waiting to accept a furniture delivery on your behalf. We can refer contractors to perform any services beyond our scope. We are available to supervise this additional work. We can provide owners representative services for larger projects as well.